Solar water heating systems include solar collectors and hot water storage tanks. In most installations, an antifreeze solution is circulated through solar collectors to extract heat, which is delivered to the storage tank. A solar hot water system that can meet a household’s water needs during summer months may need to be supplemented with a conventional backup system for periods of limited sunlight or high usage. Courtesy the Department of Energy. 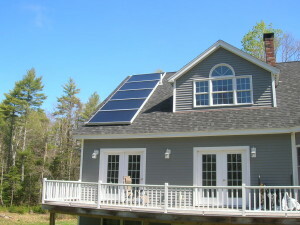 Panels are most effective when they are installed facing south with full sun exposure. Consult a NABCEP certified solar professional listed on our vendor locator tool to find out more about what kind of system would meet your domestic hot water needs. Low-cost hot water – A solar hot water system can significantly reduce hot water costs because the energy to heat the water comes from the sun. Reduced environmental impact – A solar hot water system gets its heat from the sun, a renewable resource. No combustion – A solar hot water system presents no risk of fuel or combustion gas leaks. High installation cost – Solar hot water systems are typically more expensive to install than other water-heating systems. Back-up required – Solar water heating systems generally require a backup system for cloudy days and times of increased demand. Solar exposure required – Not all buildings or roofs are good candidates for solar hot water systems. Ideally, installations should be on southern-facing roofs with unobstructed sunlight. Homeowners interested in finding out more about solar hot water systems should contact local certified installers and visit the Department of Energy’s guide to solar water heaters.